The CW dropped a new trailer for “The Flash” on Tuesday, teasing Season 5’s big bad, Cicada, and Barry (Grant Gustin) and Iris (Candice Patton)’s daughter… from the future. In the trailer, Nora (Jessica Parker Kennedy) admits she made a “big mistake” in traveling back in time. For one, she’s stuck in the wrong timeline now, and for two, her time travel has undone the fact that villain Cicada was defeated in the future. Now he’s back, and lurking around in the shadows (hence the title of this tease: “Shadows Trailer”). The CW announced in July that Chris Klein would be joining the “Flash” cast as the new villain. Described as a grizzled, blue-collar everyman whose family has been torn apart by metahumans, Cicada now seeks to exterminate the epidemic — one metahuman at a time. “You guys beat him — at least you were supposed to,” Nora tells her parents of Cicada. The trailer also teases some melodrama: at the end of the 39-second spot, Barry asks his daughter what happens to him in the future. The network also released a new tease for the second season of “Black Lightning,” in which we see the return of Feeland’s villain Tobias Whale (Marvin Jones III) as well as the rise of the father-daughter duo of Black Lightning (Cress Williams) and Thunder (Nafessa Williams). Watch that trailer below. “The Flash” season five premieres Tuesday, October 9, at 8/7c on The CW. Grant Gustin, Melissa Benoist, Jesse L. Martin etc. 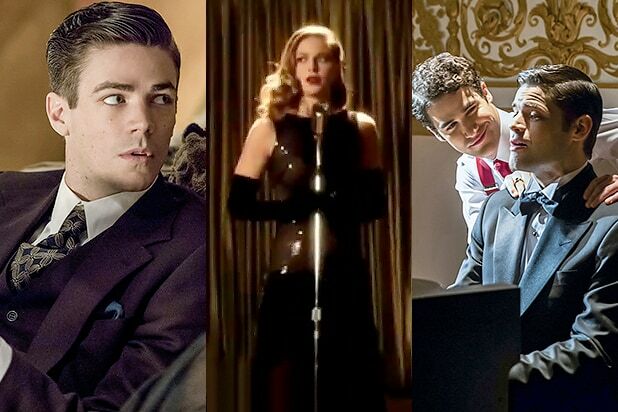 get to show off their musical theater backgrounds and singing chops in "The Flash's" first musical episode, "Duet," and it's a delight for fans of both shows. They managed to squeeze five musical numbers into the episode, and here's our ranking of each performance. Benoist gives a lovely, understated performance of the song made famous by Audrey Hepburn in "Breaktfast at Tiffany's," but in a high-energy episode, this one was a little sleepy. This "Guys and Dolls" ditty with the confusing lyrics ("sheep's eye and licorice tooth" ... huh?) was a highlight of the episode, mostly because of the talent performing the song together. When Victor Garber, Jesse L. Martin and John Barrowman want to sing you a lullaby, you shut up and enjoy it. This ensemble number sends a jolt into the episode and really cements that Barry and Kara are, in fact, trapped inside a movie musical. Plus Jeremy Jordan's voice, which gets a nice solo moment, is just undeniable, let's be honest. The only song not performed in the alternate universe, this original song from the "La La Land" songwriters was the perfect declaration of love from Barry to Iris. And it was just nice to keep the magic going for just a little while longer after everyone woke up in the real world. The pinnacle of the musical performances came from this original song written for the episode by "Crazy Ex-Girlfriend" star Rachel Bloom, who managed to encompass the levity and comedic chemistry between Barry and Kara into one three-minute number. Fresh, adorable, funny and expertly incorporating a tap number for the duo (thank you Rachel! ), this is the number that will be remember from "Duet" and rightfully so.